In a small bowl combine Italian Salad Dressing Mix, garlic powder, onion powder, salt and black pepper. Lightly season each chicken breast with a little of the spice rub and place on a greased baking sheet. In another small bowl combine parmesan cheese and mayo. Spread a dollop of the mayo mixture on each chicken breast. 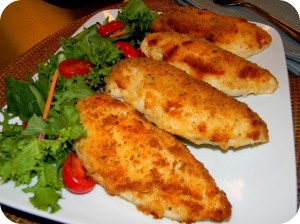 Sprinkle a tablespoon of Italian Bread Crumbs on each chicken breast. Bake for 30 -40 minutes or until thoroughly cooked. Let stand for 5 mins. Eat & enjoy! Posted on July 15, 2012, in Lady Fab Cooks and tagged boneless chicken breast, chicken breast, dinner, entree, Italian bread crumbs, Italian salad seasoning mix, parmesan, Pollo Vegetarian, the porter house grille. Bookmark the permalink. 1 Comment. I love chicken and this is really a delicious main entree.